In a large bowl or stand mixer, beat together the butter and brown sugar until the brown sugar is mostly dissolved. Add the vanilla, cream cheese, and powdered sugar. Beat until soft and fluffy. Spoon cookie dough dip into a large serving bowl. Serve with strawberries, Cookie Crisp cereal, and sliced apples for dipping. 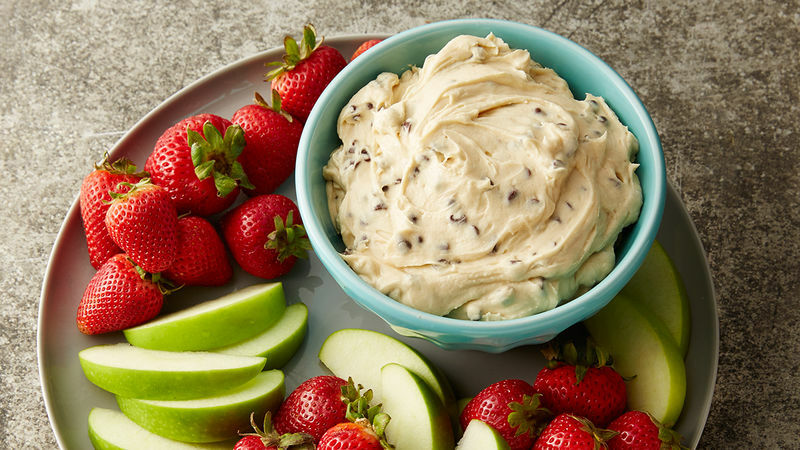 Give your party a sweet start with Cookie Dough Dip! All cookie dough, all dip, all yum! Got a hankering for spooning into a bowl of Chocolate Chip Cookie dough? Yeah, we get those, too. Like, weekly. Okay, daily. Okay, every minute of our lives. So here's what we're going to do about it. We're going to make ourselves a pretty little recipe of Chocolate Chip Cookie Dough Dip. Without, you know, all that ish that makes it so you can't normally live on cookie dough, and cookie dough alone. We're talking eggless and flourless. Yep. The universe loves you, baby. To start, you'll need just a few basic ingredients. This dip is basically a brown-sugar and vanilla flavored cream-cheese buttercream, so it's not hard to whip together at all. Just toss all ingredients into a stand mixer and whip until whippy. Then, grab a spoon and taste test. Lots and lots of taste-testing. It's seriously that simple! (See? Told you minute-by-minute cravings of the cookie dough stuff would not be unrequited forever. We got your back, our little Cravey McCraverson.) To really enjoy the flavor of the dip, serve it up with Cookie Crunch cereal, sliced apples, strawberries, and a twinkle in your eye.